A bricked-up window containing 15th Century glass and a Georgian baker's oven have been found during restoration work on a city's "hidden gem". Tunwell's Court has two shopfronts either side of a passageway in Trumpington Street, Cambridge. 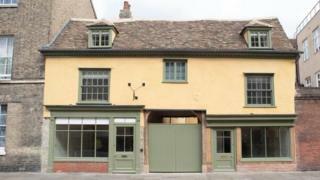 The property has been restored as student digs by Cambridge University's oldest college - Peterhouse. Senior bursar Ian Wright said the Grade II-listed buildings were in a "near dilapidated state" before work began. Other finds included an 18th Century baker's sign, a well and a "near intact" Victorian copper, used to wash laundry and heat water. Dr Wright said post-war repairs on the "hidden gem" prevented the Tudor wooden structure from "breathing". He said: "A lot of the wood literally turned to dust and had to be scraped out, with replacements found." Master carpenter Vince Thorby took more than two years to restore the buildings for Peterhouse. Tunwell's Court dates back to the 16th Century, but, in the centuries since, its garden and yard were filled in to create a passageway with buildings on either side. Its name comes from the Tunwell family, who ran a bakery from the site for more than 40 years from the late 18th Century. The shop's sign was found hidden in the baker's oven, which had in turn been bricked up behind a fireplace. It has been restored and re-hung above the shops. Another surprising find was a bricked-up but still glazed window, which is believed to date to the 15th Century. Dr Wright said: "Glass was expensive in the 16th Century, so it appears the window was recycled. "Then in the 19th Century, a building was put up right against the window and it vanished from sight." The college will use the flats for post-graduate students and visiting fellows. The college did not wish to disclose how much the building had cost to renovate.